I just checked the calendar. 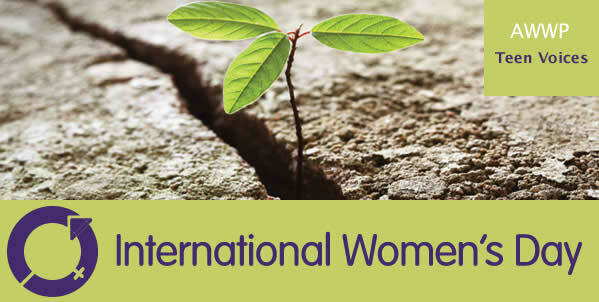 March 8th, International Women’s Day is here. I closed my eyes and tried to imagine good days for Afghan women. I couldn’t think of anything. Finally, a dark image appeared and I heard yelling and beating and the face of someone I could not see well. Then I saw the livid faces of women all around me. The biggest problem that Afghan women face is a lack of security. In Afghanistan when a woman raises her hand, people will threaten to cut off her hand. There is no justice for women. If a woman talks about her rights, she is called a prostitute. People believe that such women are like a virus and need to be removed from society. If the Afghan government respected women, they would tell men that if you cross the line and use abusive behavior, you will go to court before a judge. We should cut out these cancerous tumors from our society. But once again, the culture of the Afghan society doesn’t allow women to speak. If they do, they are killed or maimed. Without laws, there is no justice. The religious leaders, the mullahs, teach wrong things to the men and manipulate the word of Islam. Men make women their slaves. Those who argue with the mullahs are called non-believers and threatened with death. Last year was a beautiful year for many of us, but not for everyone. Maybe some of the people who celebrated March 8th then will celebrate it again this year. But what about Afghan women, who face problems daily trying to standing up against violence? Women who don’t know if today is their last day? Last year was a terrible year for Afghan women: Farkhunda was murdered outside a mosque in Kabul; Shokria and Tabasum decapitated; Rukhshana stoned in a northern province. Zainab, Mehri, and Mariam were killed because they worked for freedom. Reza Gul’s husband cut off her nose. A little girl was raped by a mullah. The Taliban beat a woman because she wanted to go to the doctor with her brother-in-law in Faryab. Another woman was beaten because she spoke with a man on a cell phone. Many girls are forced into early arranged marriages. Women are killed in suicide attacks. The day that everyone celebrates around the world is just another day of suffering for Afghan women. There are still many unwarranted beliefs and superstitions against Afghan women that lead to deaths. Education and culture offer solutions, but the most important thing the world can do for Afghan women is to show the men how their lives would be without women. Men who can’t respect a woman’s rights should be punished by a court. Without the government’s attention, men won’t change their behavior. By ignoring the suffering of women, the government is encouraging men to continue with the violence and abuse. The Elimination of Violence Against Women law (EVAW) has still not been accepted by Parliament for many years. But helping Afghan women to become more independent and get jobs to support themselves and their families would make a big difference. I wish for the day when women living in my country could celebrate March 8th without fear. Men would not beat them, but would bring them flowers. Men would understand that women are half of their lives and they should respect them. I not only wish, but I will work hard for these changes. I wish a Good Day for all women around the word, especially those who work with the Afghan Women’s Writing Project. Zahra is a student living abroad. It is so painful to read these words and really try to appreciate the brutal realities that so many Afghan women live each day. Thank you, Zahra for continuing to share your writing with us, fighting against the silence. It’s an honor to work with you.